Accommodating hospitality, pleasantly comfortable surroundings and timeless elegance have been offered in Frankfurt under this name for more than half a century and over a period spanning three generations. 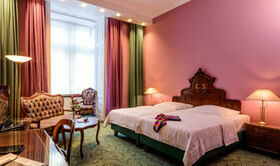 Hotel Palmenhof, a red sandstone building from the Art Nouveau era, offers every amenity imaginable and is centrally located, right in the heart of Frankfurt and in the midst of the elegant residential district of Westend. 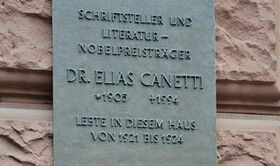 Elias Canetti was born in Bulgaria on July 25th, 1905, as the eldest son of a wealthy Jewish-Spanish mercantile family. At barely 16 years of age, Canetti together with his mother and two brothers moved into “Pension Bettina” in the fashionable Westend district of Frankfurt am Main, for three years. From there it was just a stone’s throw to Wöhler-Realgymnasium, the school where he completed his university entrance diploma in 1924.